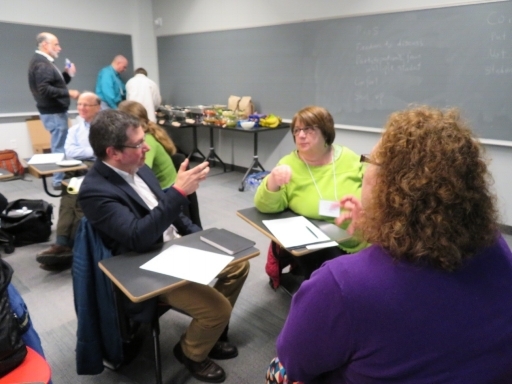 For the past several years, a group of professors in upstate New York have been meeting to share experiences related to the use of Inquiry Based Learning in their mathematics classes. Together with funding from the Educational Advancement Foundation and the Initiative for Mathematics Learning by Inquiry, they have built upon this community in new and profound ways. They invite you to see what is happening in their area, and how you may join in and get involved! Support for your IBL experience. There are gatherings such as dinner meetings, or e-mail conversations to discuss all aspects of teaching IBL: planning, initial implementation, daily workings of the classroom, and writing of course notes. Mentoring for those who want a personal connection to another IBL practitioner. This allows for a supportive network to exchange ideas between the more experienced and novice users. Workshops to help develop IBL skills and practices. These workshops are usually aligned with the MAA Seaway Meetings. Open Classrooms of IBL practitioners in our area. The aspect of classroom visitation can be very enriching, regardless of personal experience or comfort level with IBL. 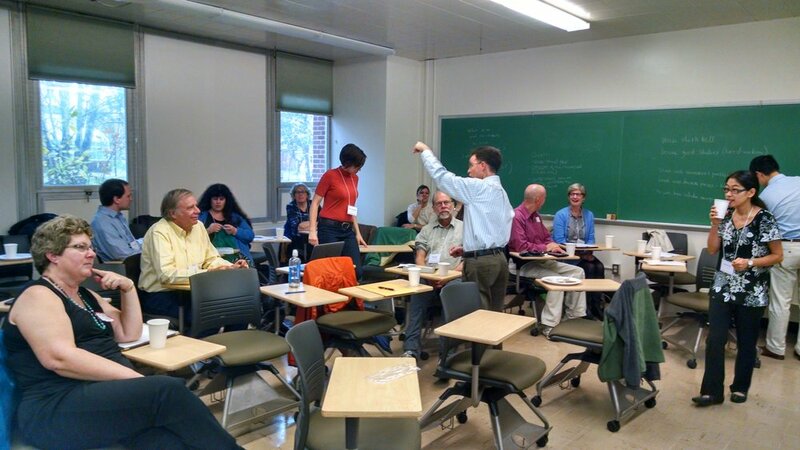 We coordinate visits with one or more professors using IBL in their classrooms. Funding may be available to support our IBL community. We can fund mentors and mentees with classroom visitations if needed, or to attend a Seaway Section meeting. Our funding also allows for the numerous activities listed above, and for additional personal projects upon request. There will be an IBL workshop at the Spring MAA Seaway meeting at St. John Fisher College. The MAA meeting is April 5-6, 2019, and the workshop itself will begin at 4:30pm on Saturday, April 6 (after the main part of the conference). Matt Thomas (Ithaca College) and Rich Spindler (SUNY Plattsburgh) will facilitate the workshop. The workshop is titled Pieces of IBL - how to implement elements of Inquiry Based Learning. A description of the workshop appears below. We'll provide dinner at no charge! Workshop description: There are plenty of reasons why you might not want a class to be entirely IBL-based. There might be particular courses, semesters, or groups of students where you’d like to moderate the use of inquiry-based methods. In this workshop, we'll discuss ways that you could implement (or have implemented) pieces of IBL or IBL-like activities. Bring some ideas for topics or lessons that you'd like to make more inquiry-oriented. All current or future educators are particularly welcome to attend. In addition to the workshop, we’re lucky to have some special guests at the Seaway meeting. David M. Clark (SUNY New Paltz) will give a presentation titled A Uniform Geometry for High School, University and Theoretical Mathematics. In this hour-long event, David will present a single formulation of Euclidean geometry that is rooted in high school mathematics, can be taught at a deeper level to pre-service high school teachers in colleges and universities, and that has a full foundation at the research level. David has literally written the book on IBL geometry, so this should be very interesting! There will also be a short workshop by William “Bus” Jaco (Oklahoma State University) titled Student Learning and Success in Entry-level Mathematics: First-year Math Courses, Corequisite Instruction, and Mathematics Learning by Inquiry. His workshop will be about the use of IBL and corequisite instruction in first year math courses in Oklahoma and the successes they have had. We're planning dinner meetings across the region for the spring semester. If you're interested in hosting one near you, e-mail the UNY IBL mailing list (which you have access to if you are on it -- rather not broadcast the e-mail address here!) or send an e-mail to (uny.ibl at gmail dot com) with a time you'd like to get together and we'll set a date/time and send out invitations. UNY IBL is working on an interesting project with middle and high school teachers in the Buffalo and Rochester areas. Through the development of inquiry-based course modules by teacher-leaders and the dissemination of these modules via Math Teachers' Circle series, we are spreading inquiry into the pre-college classroom. Thanks to support from the National Center for Civic Innovation and 100Kin10, along with help from MLI, AIM, AMTRA, and a whole host of others, we are able to bring the Math Circles of Inquiry project! To join our mailing list at any time, send e-mail to uny.ibl at gmail dot com. We'll get you set up and you'll receive announcements about what's going on.